Function of the configuration, the S1 and S2 will have his best efficency in fuction of the ground. 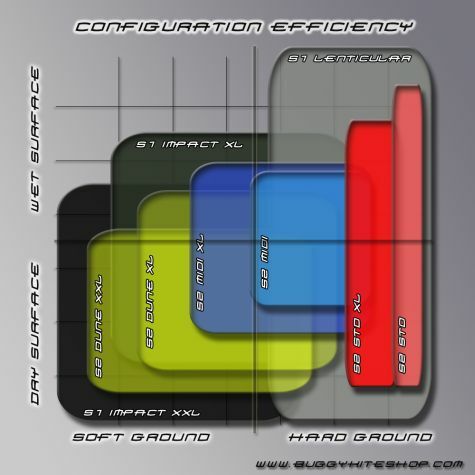 Whether it is hard or soft or dry or humide, the following Graph gives a global overview of the optimum configuration function of the Ground Conditions. We do not recommend this configuration to very beginners. Better to have experience before selecting the sysmic S1 practice, let's us say a minimum is to know how to slow down your equipment and then riding in a security context. The structure is available in 304L stainless steel polished, the fastenning is stainless steel 316L. Ultra-stable and well balanced with an optimized center of gravity, this tank is designed for international races. You'll get a shock when you observe this unique design. It must be said that these two rear wheels are really impressive! But beyond this first contact, you will discover fabulous crossing capabilities and amazing stability! As for the look , simply await the public reaction. 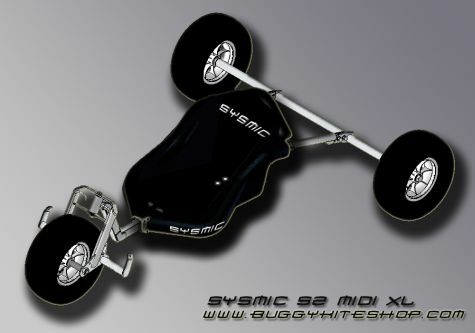 Designed in collaboration with the French LandYactch manufacturers, the BKS team launched production of 17''aluminum designed for Kite Buggy. Ultimate Configuration for hard sand with or without water film on the surface. The decrease in friction won by the small area of wheel allows you to trim and maintain the same top speed! A quick gybes you several scores of meters, transfers and fluid acceleration entering the wet! This Buggy will allow you to start, grow, and last time when your technical constraints will impose increasingly strong and repeated. 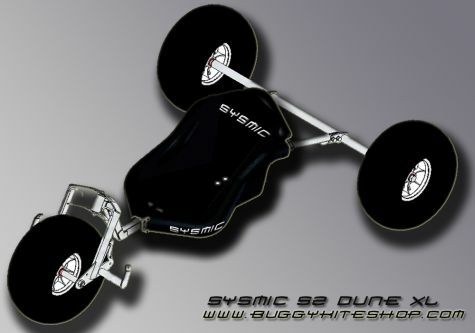 You will not be obliged to replace one year after its acquisition because our Buggy "mid size" design are almost identical to our Buggy for competition. A comfortable seating with spacious seat, the side bars as "incoming type", a folder back to stiffen the assembly and press the feet during the difficult passages in order to remain perfectly locked into the Buggy cell. We also offer this COMPACT real "S" beam, reinforced and gives free space for the pilot. 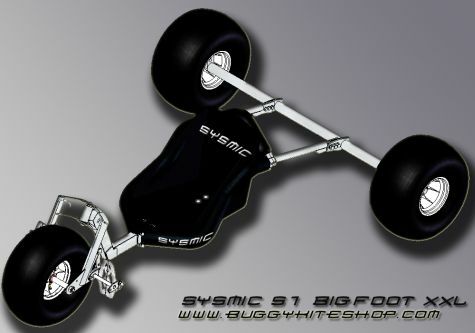 Stability very impressive with its geometric design and its exceptional rigidity and a weight for a car of this size, you will reach speeds of over 70km / h without any apprehension. 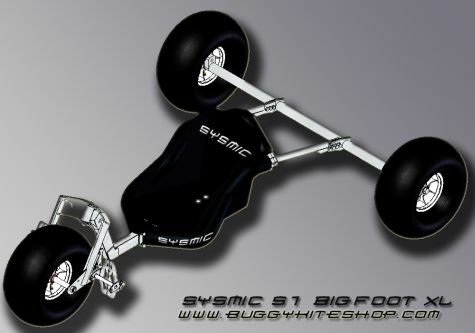 First Buggy choice because of its price, this version with standard tires is prefered for hard surfaces where you can get the most. Starting progressing with this version, more stable, will allow you to speed-up. Best drivers will exceed 90 km/h! The MIDI wheels make it convenient and universal, easy to store in the trunk of your car. 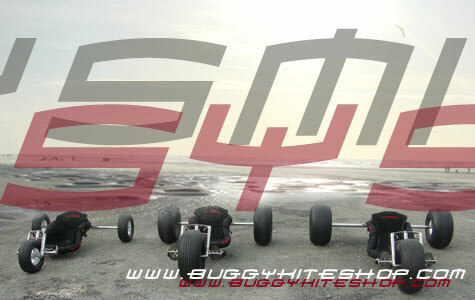 The width of 180mm wheels makes the difference that may be missing with MIDI tires to pass soft sand benches. 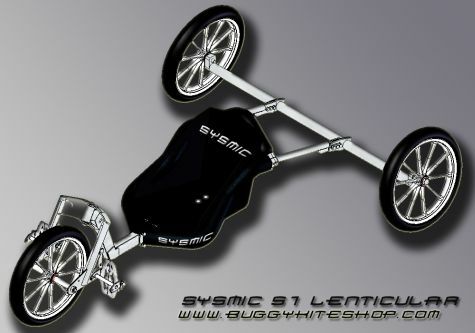 This Buggy is ultra versatile, the perfect partner for hiking and top speeds sessions. It is designed to be the ultra-crossing configuration, then drive it and have fun! And if you want to cruise along the beach, just press the gas on your kite. With this configuration, nothing can stop this car, not even the dry sand!